We are providing an exclusive accommodation for tourists and other guests interested in the unexplored area of high biodiversity and rich technical, cultural heritage located between the Alps and the Adriatic Sea. Warmly welcomed all of you! You will be guided in the undergrounds and in the fascinating surroundings by a well-known local guide if interested. A help from a family member 24/7 is at your service. Apart from that, you will be able to get the rare insights into local life by staying the nights at Apartma Rožica in the city centre. For all those, who like to stay in an accomodation that is not a hotel, but rather a more-connected to the ground and local environment. You can choose among several daily trips, dedicated to different topics important in the history of Idrija and the area. Heritage of World War II. In Idrija you can see the tourist mine Antonijev Rov (Anthony's Shaft), the exhibitions at the Municipal museum Idrija in the castle Gewerkenegg, numerous sights in the town centre, the lace exhibitions at the Lace School Idrija and much much more. The vicinity of Idrija offers many possibilities to relax, enjoy the peace and quiet of the unspoilt nature, do different sports and more. Welcome to Idrija and the region! Welcome! Dobrodošli! We are providing an exclusive accommodation for tourists interested in the unexplored area of high biodiversity and rich technical, cultural heritage. Free WiFi & mountain bikes. Shared other utilities as fully equipped kitchen, living room, hallway and bathroom with WC. The Idrija region is rich with its natural, tehnical and cultural heritage. Upgraded version of European Continental Breakfast in a kitchen or on a terrace, which is served in bed. Private spots with massage utilities alongside nearby river. If you need a professional stick, it is 4 EUR/h. Parking spaces are cleaned regularly, maintained and there is active surveillance and security enabled. Garlando top quality football table. We have 4 bikes on stock for our guests. For outside guests there is a surcharge of 5 EUR for this service. 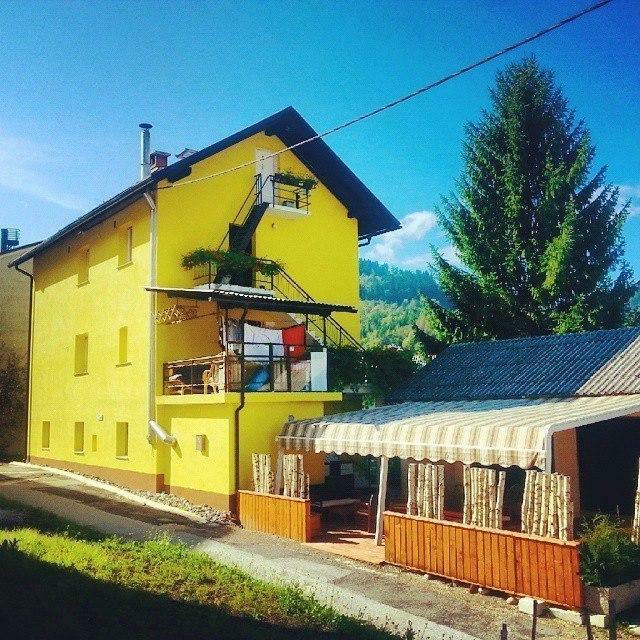 Penzion Rožica, Apartmaji in sobe Rožica, Hotelirstvo in turizem, Rožica Ferjan s.p.